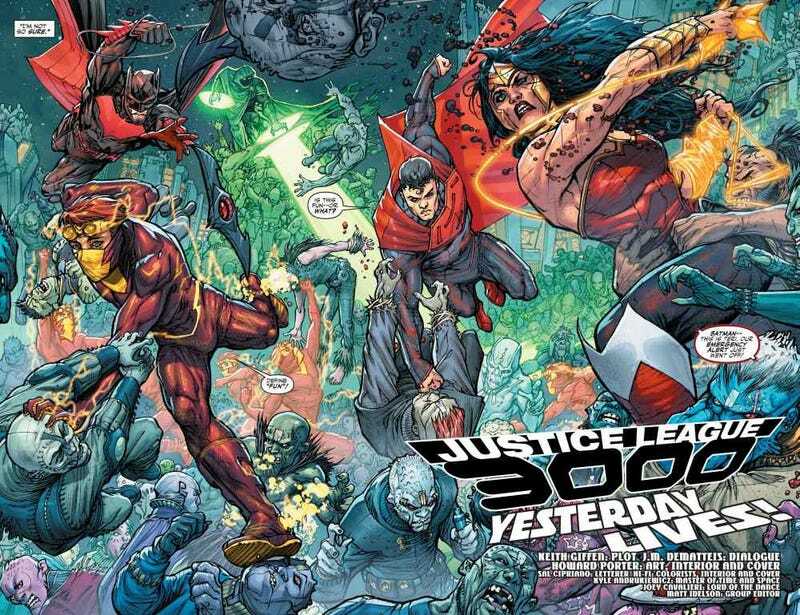 Anyone else been reading Justice League 3000? I've finally gotten a chance to start getting caught up on my comic backlog, and one of the series I'm working my way through is the new Justice League 3000, which I'm having a lot of fun with so far (I'm only through #3, although I have everything up to the latest issue, #6). If you haven't been reading it, the basic premise is that in the year 3000 a mysterious force called the Five (which we haven't really met yet, other than what I assume to be one of the Five, Coeval) appear in the galaxy and promptly start to take the whole thing over. Cadmus (who are still around in the year 3000) spend ten years fighting them with no efficiency, before making one last-ditch effort, cloning the Justice League. The cloning process doesn't go totally right, and the heroes wind up not having their full power sets (for example the cloned Flash still has superspeed, but doesn't have friction resistance, which I think is a really clever twist on his powers), and with only some of their memories. The result is a mess of a team. Superman is an egomaniac who doesn't seem to fully understand that he's not the same Superman he remembers being, Wonder Woman is incredibly bloodthirsty and borderline psychopathic, the Flash is ultra-neurotic, Green Lantern is just kind of confused by the whole thing, and Batman can't stand the lot of them. The writing is clever (although my only point of contention with the story so far is Wonder Woman's characterization, which, mind you, might be the point), the first villain they've fought is a lot of fun, Locus, a bratty 19-year-old girl with a crush on Green Lantern who happens to have psychic abilities which allow her to warp reality to her will. I'm also a big fan of the art, which seems pretty good across the board. The facial expressions especially actually seems really good at giving you an idea of what the character's personalities are at a glance. I think the new costume designs range from "good, but kind of boring" (Superman and Wonder Woman's) to "really neat" (Green Lantern's). Plus, they've written the Wonder Twins into New 52 continuity as the scientists who are behind the Justice League 3000 experiment, which I think is a good fit for them (and I'm assuming at some point they'll have a lab accident or create some tech which gives them their iconic powers). Being set a thousand years in the future, it's also generally removed from any parts of the New 52 I don't like. Actually, as of right now, Justice League 3000 and Batman Beyond Universe are the only DC books on my pull list, which should probably say something about the state of DC as a whole. If I look at it really cynically, I wonder whether this book exists as DC's answer to Marvel's Guardians of the Galaxy, since that movie is coming out later this year, and the Sci-Fi world they're set in along with the "morally-questionable heroes have to save the universe" theme seems a little bit reactive, but regardless of whether that's the case, they're telling a good story, and that's what matters. So yeah, I'm only three issues in, but I'd give this a tentative "check out the trade" recommendation if you haven't been reading it. Interested to hear what anyone else thinks, if they've been following the book.